Note: The morning after this story was originally published, I received word from Team Marketing Report that they made several corrections to the FCI which was included in their Wednesday press release. It was the source for the 2018 numbers in this article. The changes are relatively minor overall, however, the adjustment to the Philadelphia Phillies’ FCI dropped them below the Cardinals in the updated rankings. As a result, St. Louis has the eighth-highest FCI, not ninth. The update to the MLB average FCI itself is only pennies and St. Louis’ numbers did not change. Since this is a reference document, I decided to make the appropriate corrections below. With the start of another new season, it is again time to analyze the annual Fan Cost Index (FCI)*, which compares the price for a family of four to attend a Major League Baseball game across the 30 franchises. The data is compiled and published by Team Marketing Report. While the St. Louis Cardinals have ranged between having the 10th and 15th-highest payroll in the game since moving into Busch Stadium III in 2006, the cost to a family to attend a Cardinals game has consistently ranked in the top 10 compared to their MLB peers. The gap of five ranking places between these two very different measurements is the lowest since 2014 when St. Louis’ payroll was 10th and its FCI was sixth. The Cardinals’ 2018 FCI of $257.16 represents an upturn of 0.9 percent compared to last year. It is the team’s ninth increase in a row and 15th in the 16 years that I have been tracking it. However, this 0.9 percent FCI increase for 2018 is significantly less than the 4.5 percent growth last year and is the lowest for St. Louis since a 0.7 percent bump in 2012. The report also notes St. Louis was one of 15 MLB teams whose 2018 FCI increase is below the Adjusted Cost of Living rate of 1.5 percent. In the overall FCI ranking, St. Louis improved from fifth-highest in 2017 to the eighth spot here in 2018. In the table below, comparative data is presented back to 2003. First is the Cardinals Opening Day player payroll and rank of 30. Next is St. Louis’ FCI, change from prior year and rank. Next are the FCI averages across MLB. At the far right are the most and least expensive teams in FCI. Note: The source of annual club season-opening player payrolls is USA TODAY. For Cardinals general admission tickets, this year’s average price of $35.54 is just 0.9 percent up from last season, but is approaching $6.00 higher than the team’s average ticket price of $29.78 when the new ballpark opened in 2006. Across MLB, the average ticket price increase this year is 2.7 percent, to $32.44. The Chicago Cubs rank first in MLB in average ticket price at $58.57 and lead in the FCI as well for the first time, at $368.28. The Cubs unseated the long-time expense leader, the Boston Red Sox, a club which experienced a 6.1 decline in FCI compared to 2017. The average FCI across MLB of $230.64 represents a 2.4 percent increase over last year. The best value in the game is the $145.58 it takes for a family to see the Arizona Diamondbacks, lowest for the 10th year in a row. The other teams in the NL Central reside in the lower reaches of MLB clubs in FCI: Milwaukee Brewers (19th), Cincinnati Reds (26th) and Pittsburgh Pirates (28th). 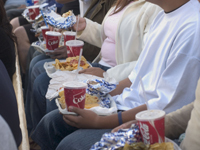 * The FCI, developed by Team Marketing Report, is made up of the prices of four adult average-price tickets, two small draft beers, four small soft drinks, four regular-size hot dogs, parking for one car and two least expensive, adult-size adjustable caps. In these measurements, the Cardinals are above the MLB average in general seating ticket prices, soft drinks, parking and baseball cap prices but below average in premium seating, beer and hot dog (barely) pricing. Not every group of four would spend this much money, and of course, these are averages, not absolutes. However, the FCI provides a consistent point of comparison across the 30 teams over time. Brian Walton can be reached via email at brian@thecardinalnation.com. Follow Brian on Twitter.